WHAT IS DEMOCRACY? is a film posed as a question, and a question that opens up yet more questions. Directed by Astra Taylor, the film is a series of interwoven, cumulative, and unsettled conversations across sprawling sites and with diverse participants — kind of like the history of democracy. And perfect for reflecting on in an interview. Unsettled, however, does mean inchoate or unstructured. The film is systematically organized around a set of three unresolvable paradoxes at the heart of democracy. First, that of the demos, the collective subject of democracy. Right away this collective is problematized: the democratic people are not made in circumstances of their own choosing, but rather emerge in contexts already riven by inequality and distorted by alienation. “The social body,” as Silvia Federici puts it in the opening scene, “is a dismembered one.” Second, there’s the tension between democracy understood as an ongoing process and democracy understood as concrete institutional arrangements of decision-making. On the one hand, the film presents democracy as a constant struggle toward a utopian horizon of collective self-rule — a horizon that moves away from us, even as we move toward it. On the other hand, the film presents us with myriad models of what the late Erik Olin Wright called “real utopias,” from worker cooperatives to community-run health clinics to the forms of participatory democracy practiced within social movements. And third, there are the slippery, and proliferating, meanings of democracy, a word claimed to justify competing political projects, a word stretched to Orwellian proportions, so thin that it even encompasses its opposites. To say this film is timely is an understatement. The politics of migration and the ascendance of the nativist right across the Atlantic have brought to the fore the question of the identity, and the boundaries, of the people. At the same time, a resurgent left in the United States and the United Kingdom has confronted the complex relationship between grassroots mobilization and electoral politics, as well as experimented with new forms of organization. Moreover, with the global rise of right-wing populist leaders, we are witnessing a particularly intense debate over the very meaning of democracy. Who claims the mantle of “the people,” and to what ends? How can the word “democracy” provide cover for anti-democracy? And what types of identities, movements, and campaigns might best confront revanchist nativism, and also offer an alternative to establishment neoliberalism? Such questions have only become more fraught, and urgent, in the context of a rapidly warming world. What is Democracy? doesn’t aim to provide the answers. But it, like democracy in its most radical sense, believes in our collective power to tackle these challenges. THEA RIOFRANCOS: I want to ask about Silvia Federici’s statement at your film’s start: that we should not abandon the term democracy. She issues it as both a warning and a call to action. So I’d like to ask: Why should we not only hold on to, but expand and reinvigorate, the concept of democracy today? ASTRA TAYLOR: When I began the film, I wasn’t convinced that it was the case that we shouldn’t abandon the term, and I think, in a way, the whole film was an exercise of really thinking this problem through. It’s a problem for me, and I’m sure for others of my generation who grew up in the 2000s, when the big formative experience was George W. Bush bringing democracy to Iraq. So democracy is a word that just seemed to be so hollowed out and empty and to often mean its opposite. But what I’ve come to believe through the making of this film is that what I thought was a disorienting vagueness and a sort of vapid ambiguity is also a source of profound strength, because it gets to this idea that democracy is an ever-expanding horizon. I completely agree with you, and I wonder why in this moment, compared to the moment of Bush, the term actually feels more powerful just as it’s being disfigured. Its disfigurations are more intense, but its radical potential seems equally inspiring by that same token. It’s interesting that it feels more relevant when a word like socialism also feels revitalized and important. And I think it’s because there’s a sense of democracy from below actually existing and gaining strength and gaining steam. I sort of knew it was a good word on a purely intellectual level. Like, of course I’m not against democracy, but it wasn’t a word that made me feel passionately moved. I liked words like equality and liberation and socialism and communism and revolution. But I don’t know. I agree with Silvia Federici in that scene. It’s a word we can’t let go of. And it’s a word that requires all sorts of robust structures to actualize, so it’s not a simple concept. I’ve come around to small-d democracy since making this project, and I didn’t know where it would lead me. I really didn’t. Something else that I’ve picked up on in the film, and in a few words you just said, is the way that claiming democracy kind of reinserts us into this long history of struggle and into this really intense global present at the same time. Democracy, like some of those other words — liberation does this, too — feels so capacious that it can encompass so many types of struggles for freedom and autonomy that it allows us to connect with those struggles and to see ourselves as carrying forward a project that has never and maybe never will be finished. Part of why I like the concept, too, is it makes us question, “Who is the demos?” The demos I would like to see is a much more expansive one that even goes beyond the human, but it’s open. It’s open for transformation and something we can debate and experiment with going forward. So I want to pick up right there with the first big meaty question of the film: the definition of the demos. This is a really fraught question in democratic theory, and it’s a fraught question in everyday democratic practice. In the film, I’ve identified a few ways that we get to define the demos. The first is this recurring organic metaphor, this notion of the social body. And then, as you just hinted at with the nonhuman, there’s another metaphor that emerges with the Greek scholar Efimia Karakantza, who calls our attention to the artifice of the demos, which is, for good or ill, the product of its social setting, the built environment, our everyday relations, and when those change, so does our capacity for self-rule. So the demos is something made or assembled by things external to it to some extent. And then, a third perspective, which actually doesn’t have the neatest name because it’s the most elusive one: rather than a delimited body or object that enframes a shared identity, it is a collectivity that only counts as “the people” when it is being constantly expanded from its margins. Which, if any, of these depictions of the demos — an organic body, an artificial assemblage, expanding collectivity — resonates the most with you? I don’t know if I have a favorite one, although I guess my heart is with the excluded, the demos as something being expanded through the people who don’t formally count demanding to be counted. But the demos as organic versus artificial? I think this is a tension that just exists, right? The demos is always a construct; it’s always happenstance, whether it’s spontaneous happenstance or one that’s created in a moment of political transformation. But the social body as a metaphor was one of those elements of the film that I didn’t expect. It is a metaphor that’s always on hand in our collective unconscious. The idea of the social body being torn apart is such a vivid one. I’m at once fearful of the organic metaphor because it feels like that can tip into ethno-nationalism, an ethnos and not a demos. And yet I also long to feel that kind of community and being part of a body politic. We talk a lot about how we’re in a state of crisis, democratic crisis. If you go back to the original Greek meaning of that term, it was actually the turning point in a disease where you were cured or you died. So if we think of the social body as a literal body, its crisis is an epic thing to be facing, and a rather scary thing. Right, it shows the stakes of the various conflicts that we’re involved in. As you see, I like to raise questions that I’m actually truly thinking about. I don’t have a pat answer. I mean, “What is the demos?” The whole point is that it’s not stable, and we deceive ourselves if we say that it is. Human beings are dying and being born. Time is real. The demos changes. Thinking through my own critique of the body metaphor and your response to it, I think it’s a misunderstanding to think of bodies as hermetically sealed or as internally homogenous. There is a way that that metaphor is pretty generative and constructive and not necessarily flattening. I completely agree with that. No body is autonomous; no body can exist by itself; and every body is the product of a natural environment. What myth of the body as singular and self-made are you buying into if you think that the social body is a potentially fascist metaphor? Isn’t it that to be a social body is to be vulnerable and permeable and embedded in multiple systems? So yes, we can reclaim the body as actually a wonderful thing for a body politic to be. Today, the question of the demos is so often posed through the question of migration, which perhaps most concretely challenges the corporeal, bounded metaphor of the demos as a social body. In your interview with her, Wendy Brown says pretty explicitly that the demos needs boundaries; there’s always a constitutive outside to the demos. But on the other hand, there’s this other notion that emerges of the demos always being made from the outside in: refugees, particularly the young Syrian woman we meet at the end of the film, Salam Magames, but also Federici’s reference to the structural exclusion of women, Angela Davis on the unfinished project of abolition in the United States, a young #blacklivesmatter activist’s contention that the struggle for African Americans to get inside the demos is endless, encountering one locked door after another, yet the struggle continues. So I’m wondering how you think through the question of boundaries and how necessary they are versus this outside-in movement of the demos being constituted through these transgressive acts? I think you’re right that those are two poles, but I don’t think they’re quite contradictions because they’re both real. Brown’s challenge is a very important one because the question I ask her is not one of nationalism. I’m not really asking her about borders, even though this is a theme of the film. In the actual moment I’m asking her about universality: can a decision-making demos include everyone? And so I think the counterpoint to that is: “Well, we live in a world of over seven billion people, and such a demos would be incoherent and very likely imperial.” That’s a pretty good counterargument. I don’t think that having bounded communities negates a belief in human equality. On the migration and nationality front, I’m 100 percent against exclusions based on immigration status and papers. I’ve lived in the United States for 38 years without being a citizen, only being a Green Card holder, and so this idea that democracy was limited to citizens didn’t make sense to me. Sure, I couldn’t vote, and I couldn’t get arrested at a protest because I might not be allowed to live in the United States after that, but for me, being part of democracy always exceeded citizenship and the simple act of voting. It was always about how I participated through writing, activism, and organizing. Showing this film has been interesting because I do see that we haven’t thought some of these issues about boundedness through. In Canada, some of the major political issues have to do with indigenous sovereignty and struggles over territorial claims, especially having to do with pipelines and indigenous communities trying to uphold treaties and prevent development that’s going to cause destruction for the entire Earth, but also for their people. So some audiences will, on the one hand, say, “Why isn’t there more about indigenous struggles and the need for sovereignty?” But then they’ll also sort of balk at the idea that democracy should have bounds. So there’s a paradox there. If you’re for this sort of sovereignty over territory, and I think from an anticolonial perspective we should be, then you’re also sort of saying that there should be bounds. There should be the right to say no. So many of these questions come down to power more than inclusion or exclusion as a principle. Inclusion can also be forced assimilation and compulsory citizenship and being absorbed. Inclusion isn’t always a virtue. Boundaries aren’t necessarily borders, and even if we got rid of nations, we’ll still have to determine who makes what decisions, when, and where. That’s why I love Wendy’s point that to date, exclusions have been built on terrible things: racism, colonialism, sexism, the question of papers, blood, or birthright. But what are ethical exclusions? What would they look like? What kind of boundaries would we make that are permeable but actually respect that some people live in some places, and they might know more than people who live far away about what’s good for them. So the film tries to evoke these dilemmas. Yes, nobody deserves a good life more than anyone else. But that doesn’t tell us how to run society democratically. On the one hand, climate change, global warming, and all sort of environmental processes exceed national boundaries, but also the actual policies and forms of mobilization that are going to get any traction are inevitably territorialized in specific places. If a particular community is affected by the destruction of oil extraction and exploration, for example, what rights does that community have to veto, to stall, to dismantle it? How we work through the very specifically territorialized processes of environmental destruction is actually an interesting way to look at how the global and local are co-constituted in this specific instance. Exactly, and in that very condensed commentary from Brown, she also makes the strategic point that if we want to dismantle these bigger, antidemocratic structures and coalitions then actually it’s going to have to be local — and not in the sense of tiny, but bounded, because it’s actual human beings who will have to put up the resistance, and, well, people live somewhere. The left has had this dream of international, global solidarity for years, but it’s something you have to actually do, and it’s a challenge. That solidarity has to be rooted somewhere. I wanted to pick up on this theme of democracy as horizon, or as an ongoing struggle. One of the productive tensions in the film is between two visions of democracy. On the one hand we get this vibrant image of democracy as constant movement: people crossing borders; protesters claiming power from below and occupying squares; the excluded demanding to seen, heard, and counted; experimentation with collectivity and solidarity. And this movement is, of course, formally invoked in the expansive, restless, and search qualities of the film itself. But then on the other hand, we get this idea of democracy as crystalized in particular institutions and arrangements of self-rule. We get a lot of really interesting examples of these, plucked from across time and space, put next to each other in somewhat uncomfortable ways. We see a textile cooperative run by Latino immigrants in the United States and a self-managed health clinic in austerity-ravaged Greece. And then finally, another form of self-rule that we get is the direct, horizontal democratic practice in the occupation of Syntagma Square in Athens in 2011. So my question is: Is there a contradiction of some sort between this vision of democracy as ongoing movement in a quite literal sense, versus democracy as a set of crystalized institutions of self-rule? Do both of these seem to be necessary to define democracy? I think they both need to exist, and this conviction is actually reflected in the film’s companion book, which I’m actually turning in the second proofs today. The companion book is called Democracy May Not Exist, But We’ll Miss It When It’s Gone, and each chapter is a paradox or tension that I think is essential to democracy. I’m not talking about Marxist contradictions — I’m not talking about the contradiction between labor and capital because I can imagine a world where that, the fundamental conflict of our time, is resolved, but I still think democracy would have all these other tensions. So one of them, and I think this is sort of what you’re getting at, one chapter in the book is about “spontaneity” and “structure,” which I guess we could also call “planning.” It’s the question of whether democracy is the constitution and the rule or law, or these democratic outbursts, moments of what Sheldon Wolin would call “fugitive democracy.” I think the reality is that both of those elements are there, and that’s sort of the dialectic by which democracy progresses — experimentation and revolt, and then things get sedimented into law, which gets eroded or advanced. To me this just describes the world I’m living in. My feeling as I was thinking this through is that these seemingly paradoxical elements are essential to the project. Part of what recognizing that and putting it into words in the book has done is it has helped me get my mind around why democracy is hard. It’s not just that we’re failing at it; it contains all of these contradictory impulses. The chapters in the book are freedom and equality, coercion and choice, expertise and mass opinion, the local versus the global, the present versus the future. And these are things we have to balance. There really isn’t one prescription that will work for every moment in human history. That gets at so many of the core debates from an interesting angle — I mean, there are some debates that I don’t care that much about in democratic theory — but the ones that you’ve named are essential, I think, precisely because they’re unresolvable. People don’t like unresolvability. I see progress as having better problems. It’s so sad that as democrats we’re here wrestling with questions of capitalist exploitation and racism and sexism and transphobia. Wow, debates about democracy would be so interesting in a world where those things were settled and we got to get into the issues of how to plan an economy democratically. How do you have common ownership and worker control? What about questions of scale? I see these paradoxes and tensions as constitutive of the searching, unresolved quality of the film, but there are certain moments where they come to the fore. And one of those is when Wendy Brown brings up perhaps my favorite paradox of democracy from Rousseau’s Social Contract. The “Paradox of Politics” in Rousseau, or it’s sometimes called the “Paradox of Founding,” is that in order to have a functioning democracy you need to have a people, a demos, who are already oriented toward the desire to govern themselves. But those people are also a product of democratic processes. They need to precede them, and they’re produced by them, so there’s this chicken-and-egg problem at the imagined founding of a democratic society. One way to resolve this is to say, “Well, there’s never a beginning. We’re always acting in the messy middle of things.” But the problem still occurs because if you live in a capitalist society in which you’re alienated and individuated and taught to distrust one another and your collective power, there is a problem: how do you gain the knowledge to act as a collectivity under conditions that systematically undermine the possibility for collectivity? You know, Rousseau’s famous answer to this conundrum is just basically to have this trick, right? It would be so nice if the enlightened legislator could come in and tell us how to act democratically and then we have democratic people. But history shows that this process does happen (if not in that way), but that people do become more democratic. Even some of what passes for common sense on the far-right, people would have taken as dangerous and socialist not that long ago. We know common sense can change. Rousseau’s got his finger on something there. For me personally, this is a question that I answer in two ways. I answer it through my organizing, though a group I co-founded called the Debt Collective, which is attempting to create a new kind of activist political community by organizing the indebted and getting people to understand their indebtedness, which is a mass condition in 2019, as a political reality — to connect their personal financial struggles to a political, economic system, in other words, to capitalism. To say, for example, “I’m in debt. I can’t pay my rent because there’s not social housing. I have medical bills to pay because there’s not universal health care. I’m struggling to pay back my student loans because there’s no free universal education.” We’ve created a community of thousands of people who understand their position in the world in a very different way than they did when they were isolated and ashamed because they were struggling to make ends meet. And institutions that we build that create new forms of solidarity are doing that work in ways that I’m interested in, whether it’s traditional labor unions or tenant unions or the DSA, we’re making ourselves together into democratic people. I love that because it’s so concrete, but there’s this really deep theoretical point that you’re making that resonates with social theories and histories about how the circulation of texts — whether it’s a newspaper or a novel, or letters or diaries, or eventually films and YouTube videos — are actually in a reflexive way part of constituting their own publics. Through the circulation of texts is one way to cut through this chicken-and-egg problem. It’s not the only way, but it’s a historically quite salient way. Also, you’re interpellating your audience in a certain way, but you’re equally inviting them to think of themselves as political theorists and citizens simultaneously. Yeah, that part of this film is so intentional because I think being on the left means respecting other people. There is a tradition of political rhetoric that treats people as though they’re just vessels to be filled with our wisdom or our analysis, and it’s so condescending. I just really tried to create a film where people would feel that exact word: an invitation. To think alongside it, to think they’re own thoughts after it, an invitation to question who is a political theorist and who is an expert. 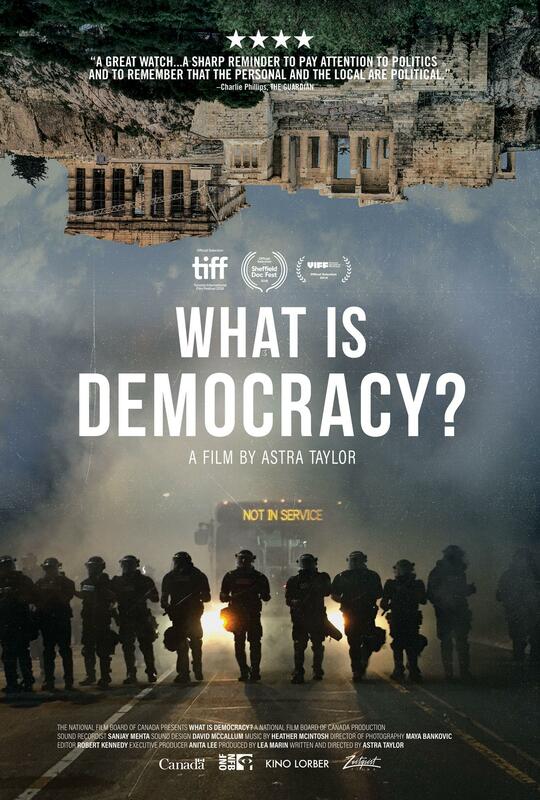 So something that comes up right away in the film is the issue of the proliferating meanings of democracy — and not the meanings we’ve developed here, these beautiful emancipatory or institutional arrangements, but the sometimes nefarious uses to which the word is put and which gave you pause toward thinking that you even cared about democracy for so many years. I’m living in Chile right now doing fieldwork, and I watched the film in Chile, and the next day I visited a museum about the Pinochet dictatorship, a fantastic museum. And one of the many things that I learned in the museum is that in 1986, a leftist guerrilla group tried and failed to assassinate Pinochet. And shortly thereafter, Pinochet appears in this very Trumpian sort of live newscast standing in front of his bullet-ridden car, guiding the interviewer through what happened. And in that moment, he declares that “this is a fight between ‘democracy’ and ‘Marxism.’” So in other words, an extremely brutal dictator claimed the word democracy to describe his own regime and leftists writ large, Marxism, as the enemies of democracy. What do we make of the very wide circulation of this term democracy and the different purposes to which it is put? And how do we hold on to and grasp its radical promise on the one hand, while trenchantly and relentlessly critiquing it, on the other, as a form of legitimation for not even the establishment status quo, but also for violence and repression? I think often when things are coopted it’s a sign of their power. Democracy isn’t a term that they can just denigrate and convince people they should have nothing to do with. People have been convinced that they shouldn’t be associated with Marxism or communism or socialism for a long time, but it’s hard to tell the people that they shouldn’t want to rule. So what they have to do is make democracy mean what they want it to mean. Look at what the right-wing has done with freedom and equality, claiming to embody both of those principles. As human beings who communicate, we have to battle for the meaning of words. I think so much of politics is about laying claim to and contesting the meanings of words and symbols, and resignifying ones so that they are emancipatory and not exclusionary. That is just the political work that we need to do. Not to downplay the dangers of cooptation, but I try to see it first and foremost as a victory. Someone thought our word was going to sell their thing, so that means that there’s something resonating about it. So how can we reclaim and change the balance of forces so that it’s our meanings that circulate? We don’t own words, thank God. We’re going to have to have a huge battle right now over the Green New Deal. It was put on the table by what counts as the left in the United States, and we’re going to have to fight with people who want to water down its meaning. That’s politics. It’s a good thing when you’re copied in politics. Yeah, and the political response isn’t to think of a more obscure terminology so that uncool people don’t touch it. I want to ask you about anti-democracy, which is a complex phenomenon but particularly so in this present global moment. On the one hand, we have these reactionary forces of popularly elected candidates, or maybe slightly less than popularly elected in the case of Donald Trump, claiming the mantle of the people and targeting something they call the establishment, though it’s not quite what we mean by the establishment. But we can also observe that once in power, they have worked to narrow, undermine, and dismantle the very limited forms of democracy that do exist, with their primary targets being migrants, racialized groups, women, LGBTQ people, and the left (and those are often overlapping sets of identities and populations). We also have these more respectable establishment figures who are in so many ways complicit with these anti-democratic assaults. One way they’re complicit is that the very unpopularity of centrism — of the bipartisan consensus in the United States, but it has equivalents elsewhere across the Atlantic — since it’s so unpopular, they actually need to limit democracy in order to attain and maintain their power. Then there’s this more historic sense in which the establishment is complicit [with anti-democracy], which is that the very policies that they promote, whether neoliberalism, border security, or mass incarceration, all of these policies are part of the mix of factors that has fueled ordinary people’s support for reaction. So there are all sorts of ways that so-called establishment politics have fed into contemporary assaults on democracy, and there are tons of examples of this in your film. What do you see as the elite strategies of anti-democracy today? Have expansions of democracy always provoked elite backlash to reinforce their power? Or are there new forms of authoritarianism, repression, exclusion, surveillance that are emerging at this moment of hegemonic crisis? Okay, so this is the kind of question that I live to think together about. I didn’t know that Trump was going to be president when this film began in 2013, and it didn’t get greenlit until 2014 or early 2015. So when I was editing, one thing I wanted to do was mitigate against the sense of novelty or foreignness, this sense that Donald Trump represents this total aberration or that he’s a European-style fascist, when of course we have our own homegrown racist minority rule in our own past to point to. So the film is structured to say no, these problems go way back. The struggle between the poor many and the wealthy few even precedes capitalism, so the question really becomes how have anti-democratic forces evolved because the goal is the same. It’s the goal of the few versus the goal of the many. If you look at even the tax on voting rights that gets mentioned by Reverend Barber [in the film], these were the same machinations that were used to squelch Reconstruction. A lot of the same dirty tricks that pooled the power of the wealthy, white business elite. There’s a whole lot of continuity at work that I think we need to pay attention to. Trump in many ways represents this strong thread of American history, but what has changed? We are currently seeing more desperate attempts to ensure minority rule, but that’s an American tradition. This country was born of that. There’s a very anti-amnesia quality to the whole film, as it reinserts us into a historical project. Looking backward is not conservative, it’s taking on a historical project that so many have struggled and died over, and getting back into that temporality is something that we need to do. Okay, I want to end where we began — just like your film does — and circle back to Federici’s call to not abandon democracy. Because it seems precisely that in the context of these myriad threats to collective self-rule, and despite all of its crazy contradictions, we need to embrace and swear our fidelity to the project of democracy. What feels like the directions that things are moving in that offer us an opportunity to deeply radicalize the concept of democracy? To carry through on its radical potential but also to take it in new directions that maybe were not foreseen by ancient Athenians? It’s not a concrete campaign or a local struggle, though I do take hope in teachers striking — but even more so that people are paying attention that teachers are striking. There’s like a collective awakening now, a way disaffection is being effectively channeled into democratic engagement and not just apathy that is unlike anything I’ve seen in my life. There’s a sensibility right now in America that goes beyond the politics that were dominant earlier where people on the left wouldn’t engage with building institutions or wanting to take power within the system. And I think people are now open to “both and.” We need to do it all. We need to protest, but we also need to take power and pull those levers of government where and when we can. There’s an emergent sensibility that I hope keeps strengthening. But there’s also a lot that scares me because I think the forces of reaction are really strong, it’s easy to underestimate them. That’s why the example of Syriza in Greece is there, because you can do everything you’re supposed to do — you can protest, and occupy, and riot, and build a political party, and take state power, and that doesn’t mean that you’re going to win. I think the same. Right now, we’re in a moment of extreme reactionary power in Latin America and beyond, but I think that the vanishing of the political center, plus just the extremely clear planetary stakes of environmental crisis, are bringing together some allies that have been counterpoised in the past, and that’s a positive development.